South Africa’s Basic Education Department’s Minister Angie Motshekga issued a circular to the national and provincial education authorities informing them that the Chinese language – Mandarin will be taught in local public schools. When issued, the minister said Mandarin will be taught as of January 2016 however that has not started and the department is yet to issue another date. The circular which was issued last year is titled “Circular S10 of 2015: incremental implementation of Mandarin as a non-official language from 2016-2018”. “The roll-out of Mandarin will be incrementally implemented in schools as follows: Grades 4-9 and 10 will be implemented in January 2016, followed by grade 11 in 2017 and grade 12 in 2018,” said the circular, which bears the signature of the department’s acting director general Paddy Padayachee. The announced plans for teaching of Mandarin followed the signing of bilateral agreements between South Africa and China in 2015. 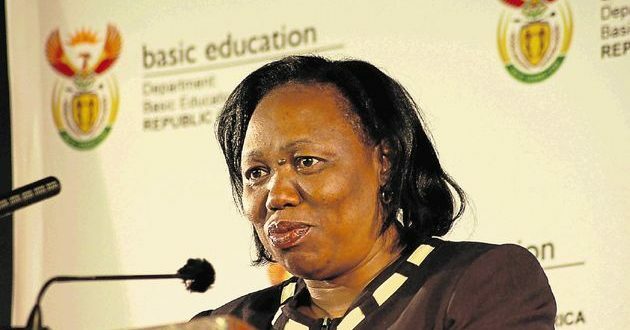 South Africa’s Department of Basic Education Angie Motshekga. In addition to strengthening business ties, the countries agreed to co-operate also on education matters. The department approved Mandarin last year, along with German, Serbian, Italian, Latin, Portuguese, Spanish, Tamil, Telegu and Urdu as additional optional languages. Elijah Mhlanga, spokesperson for the department said the introduction of Mandarin is above board. South African teachers are currently being trained in China for Mandarin pedagogy according to Mhlanga. “The Chinese government will provide support as far as teachers training as concerned. As things stand for now there is a group of teachers currently in China receiving training. Mhlanga said there is a demand from parents to teach their children the language, after all Mandarin is the most spoken language in the world.